Meet at 4.45pm in Meadowbank Road (new location) for 5pm set off to the tree then Festive Refreshments in the Village Hall. Flashing glow sticks free for kids. 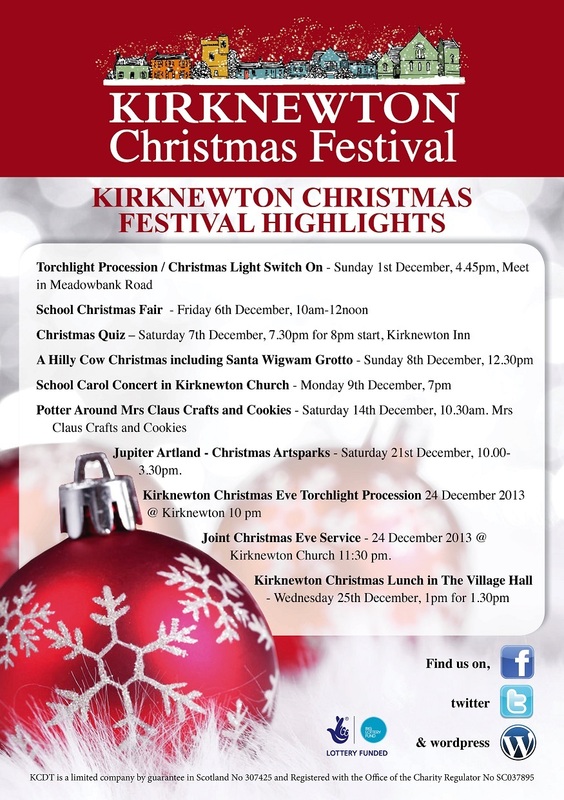 School Carol Concert in Kirknewton Church – Monday 9th December, 7pm. All welcome. Mrs Claus is coming to visit us with some of the elves! Drop your children off to have some homemade cookies and hot chocolate with Mrs Claus and make some gorgeous Christmas tree decorations and little gifts. You’ll be free to do your Christmas shopping while your kids enjoy the magic of Christmas. Tuesdays 3, 10 & 17 December 7.30-10pm. This one is for the adults – come and make your own Christmas decorations – choose from felting, pottery painting, clay or knitting and make your own cards too. Various prices. Call to book. Suitable for ages 5-14. Time 10.00-3.30pm. Seasonal workshop packed with fun-filled indoor and outdoor creative arts activities, inspired by the Jupiter Artland sculpture collection set within the magical winter landscape. In both workshops we look at different festive themes and children will return home with something extra special to decorate your home this Christmas. Joint Christmas Family Service 24 December 2013 @ East Calder Church 7 pm. Joint Christmas Eve Service 24 December 2013 @ Kirknewton Church 11:30 pm – All welcome. Alone or fancy a little more company for Christmas Day? Book your Christmas lunch place in the Village Hall by 15th December at Festival Stores. Funded by KCDT. Our wonderful group of volunteers will make you a free Christmas lunch with all the trimmings. Christmas party of “Forget me not Café” for people suffering with dementia on 19th December @ East Calder church hall from 10am to 12 midday.